We seem to keep having the same conversations about public education in Oklahoma. Money. Test scores. Poorly researched policy decisions. Money. Wait, did I say money twice? Well, it’s a pretty big deal. School districts have seen their share of state funding decrease over the last five years, and the state superintendent and her newspaper keep trying to pretend otherwise. Meanwhile, September was another good month for the blog, but a better month for other writers. I still enjoy reading other people talk about how misinformation affects their students and how it impacts them professionally. Plus, when other people are writing, I can pull back more. Clicking the retweet button is a lot easier than putting out 1,000 semi-coherent words. I’ve been able to unplug mostly for the last half of the month, which has been nice. Biology Cut Scores – Once school districts finally had their test scores, many parents, students, teachers, and administrators were surprised to see that the Biology EOI had a fairly low pass rate. As one teacher who sat on the committee wrote, “it makes me steaming mad that they overrode our recommendation, and passed their own off as the recommendation of the teachers.” It wasn’t the first time. It won’t be the last. Great News! Oklahoma is #1! – We also learned this month that Oklahoma led the nation in cuts to education over the last five years. While some have criticized the methodology of the study, the fact remains that the funding formula provides less money for instruction at a time when the legislature has record amounts of money to spend. The legislature added $74 million to public education this year. Only $21 million went into the funding formula. The rest went for testing and other SDE use. Choose Your Own Words – Finding the SDE’s sample letter to parents about test scores to be less than satisfying, I wrote my own sample letter. Believe me, it’s a lot more diplomatic than it could have been. The challenge with all of these changes is in controlling the narrative. Barresi wants the public to believe one reality. Those of us who have spent years working with children need to present a more reality-based reality. We need to do it articulately, consistently, and with facts. The Tangled Web – This one came out of nowhere for me. Apparently, the State Chamber has enlisted the Walton Foundation to serve as a catalyst in the corporate takeover of public education in Oklahoma. While reading Diane Ravitch’s book, Reign of Error, I am learning more and more to be thankful that we are behind states such as Louisiana, Indiana, and Tennessee in dismantling our institutions and selling the remnants to profiteers. I received a lot of private feedback about this proposal, and while I don’t feel at liberty to share all of it, I can say with some certainty that many local chambers of commerce do not support this initiative. So long, PARCC. We mean it this time. Probably. – As an afterthought in a memo sent by email to superintendents and district test coordinators, we learned that the state had finished the long, slow, clumsy process of pulling all the way out of the PARCC consortium. We learned later however, that the new testing contract will be written to PARCC specifications. So there’s that. October will heat things up. The campaign for state superintendent for the $2,000 raise doesn’t figure to go away anytime soon. Districts are scheduled to receive preliminary A-F Report Card scores in a couple of weeks. And there is rumor that the State Board of Education may approve them on time this year. Great News! Oklahoma is #1! I wanted to try using Great News! in the subject of a post to see if I like it. I don’t, but it makes me laugh a little. And on a day in which I’m reading that Oklahoma’s cuts to education funding are the deepest in the country, I need a laugh. The Center on Budget and Policy Priorities’ latest report, “Examining States’ Dramatic K-12 Education Cuts,” says that restoring school funding should be an “urgent priority” because of the serious consequences of steep state-level cuts on education reform initiatives and state and national economies. All the state-by-state comparisons were made using inflation-adjusted dollar amounts and primary form of state aid to local schools. • Oklahoma tops the list of 34 states that are providing less funding per student for the 2013-14 school year than they did before the recession hit. Thirteen of those states have cut per-student funding by more than 10 percent. 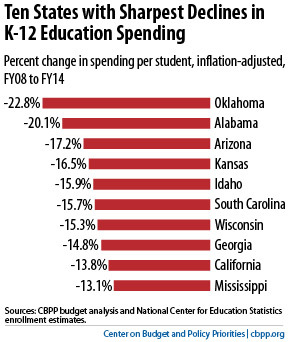 •Oklahoma was also among the 15 states that has lower per-student funding for Fiscal Year 2014 than it did in the last fiscal year after adjusting for inflation. When the Oklahoma State Department of Education released its initial state aid allocations in July for the current fiscal year, the actual dollar amounts were up $8.60 per pupil to $3,038.60. State officials attributed much of the increase to the Legislature’s addition of $21.5 million for state aid this past session, but a number of factors are expected to reduce those figures when mid-year adjustments are made. In addition to typical growth in the state’s public school population, schools across the state should also expect to see their state aid payments reduced in January because of the widespread tornado damage in multiple cities around the state this spring. A voter-approved ballot initiative commonly referred to as State Question 766, which will exempt certain intangible properties from property taxes, will also reduce state aid to schools at mid-year. While the share varies by state, nationally, 44 percent of all K-12 education spending comes from state funding, according to the Center on Budget and Policy Priorities. For local school districts that can’t raise more local tax revenue to cover the gap, state aid cuts mean scaling back educational services. Over the last several years, schools have also suffered significant cuts to federal funding. Since 2010, federal spending for Title I — the major federal assistance program for high-poverty schools — is down 12 percent after adjusting for inflation, and federal spending on education for the disabled is down 11 percent. The report cites the Bureau of Labor Statistics in reporting that nationwide, there were 324,000 fewer jobs in local school districts in June 2013 than there were in July 2008. While the recession sliced off a sizable chunk of state revenues, those funds rebounded in absolute terms in the 2012 fiscal year, according to the latest available Census data. States raked in $794.6 billion in 2012, nearly $15 billion more than in 2008, unadjusted for inflation. (An inflation adjustment shows that the 2012 fiscal year tax haul is still lower than that of 2008, by about 6 percent.) Many states began their 2014 fiscal year in July. This is what frustrates me most about the cuts. State legislatures – Oklahoma included – have more money than they did six years ago, yet funding for education lags. The 2013 Oklahoma Legislature spent a record amount of money, but they took baby steps toward helping schools. Maybe the state superintendent and members of the legislature need some training in basic school finance. For their part, the Oklahoman plans to do a print edition only story on how these cuts have impacted specific districts tomorrow. There are two reasons Oklahoma teachers haven’t had significant raises in six years. First is that the legislature isn’t putting more money into the schools in any meaningful way. Second is that the state salary scale hasn’t changed. Both of these things need to happen for anything to improve. Maybe the answer is for the state to start viewing teachers as corporations and find tax loopholes for them. But will it fit through the straw this time? The state that loves change for its own sake and the profession that loves acronyms has a new treat for you. Because our SDE has decided to vacate the time, effort, and money sunk into the development of the PARCC exam, we had to come up with our own new thing. The SDE let the world know that Oklahoma would not administer the PARCC tests, but rather would pay a vendor to develop and administer a test with PARCC-like items. Now, you can go to the state’s Central Purchasing website and view the Request for Proposals (RFP) for Elementary & Secondary School Student Testing. C.1 The purpose of this RFP is to solicit proposals for activities related to the implementation of a statewide summative assessment. The assessment will be aligned to the Grades 3-8 Oklahoma Academic Standards for administrations in the spring of 2015 with additional one year optional renewals for the administrations in the spring of 2016, 2017, and 2018. Henceforth in this document, this test shall be called the Oklahoma College and Career Readiness Assessment (OCCRA). Development and field testing of custom-created items will occur during the 2013-14 school year. There’s your new acronym, folks. OCCRA. Get ready immediately for field-testing. Keep in mind this is only the proposal to award a testing contract for 3rd through 8th grades. The End-of-Instruction (EOI) exams are separate. C. 2 This RFP will specify a complete package of products and services so that the OCCRA will be administered, scored, and reported separately from other state assessments. The OCCRA will be administered via paper and pencil to students in Grade 3-5. The OCCRA will be administered online with paper and pencil options to students in Grades 6-8. This is the same as what we’re doing now. C.4.3 Although the state testing dates for spring 2015 have not yet been officially determined, the projected dates are shown in Table 1 below. The final determination of the test administration dates for the OCCRA will be based on statutory requirements for test administration and reporting. Currently, no summative assessment may take place earlier than April 10 of each year. Immediate raw scores are required for all assessments administered online. Complete preliminary reports including the raw score, performance level and scale score must be provided no later than two weeks following the close of the testing window. When standard setting is needed the two week reports do not include performance levels. C.6.1 The supplier(s) will provide the State of Oklahoma with a criterion-referenced achievement test measuring mastery of the Common Core State Standards in English Language Arts and Mathematics proficiency for administration to students in Grades 3–8 in all Oklahoma public schools. The student achievement scores must be interpretable in terms of the criterion and must be valid and reliable for use in student promotion, retention, and graduation decisions. The scores must also be valid and reliable for use in teacher, school, and district accountability measures. This RFP does not require nor expect the Supplier to create an entirely custom test but, instead, assumes the purchase of products and services derived from existing products published by the supplier(s). The proposed OCCRA must meet the design shown in Tables 3 and 4. If you’ll look closely at the proposal, it doesn’t seem to contain anything labeled Table 3 or Table 4. Never fear – here they are in a separate document. They show that the selected vendor will report student data in terms of the strands of the Common Core. For anyone thinking that the SDE can take cover from the national criticism of the Common Core by hiding it under the newly branded Oklahoma Academic Standards, this is a rather prominent inclusion. C.8.4 Throughout the development and implementation of the OCCRA, the supplier is required to protect student privacy. It is important to note that no such requirement exists for the SDE, apparently. C.8.5 Reading passages should expose students to grade-level text of appropriate complexity. Texts should reflect a balance of 50 percent authentic literature (stories, drama, and poetry) and 50 percent informational text/literary nonfiction which would include passages in grades 6-8 that address the literacy standards requirement for history/social studies, science, and technical subjects that students are expected to read. Selections should include a combination of single texts and paired passages of sufficient complexity for close, analytical reading which would allow students to discern and locate evidence from the text to support assertions in multiple-choice items or writing responses. This is a bone of contention in the Common Core with many teachers. The 50/50 literature/informational text split is proscribed for all grades. If we were talking about high school students, there might be less frustration over this. With third grade students, who will have to pass this new test to move on to fourth grade, this is a huge transition. While schools have had three years to start the transition to Common Core, they haven’t had this split in mind. C.8.6 English/language arts items aligning to each passage should include single and/or two part multiple choice items as well as short, constructed responses to text-dependent questions. One extended response item should be drawn from a paired or multiple-text passage set. Extended writing prompts should allow students to produce opinion/ arguments, informative/explanatory responses, and narratives. Grade 3 students should be able to generate a summary as well. While the writing tests for fifth and eighth grade will now be separate, all grades will have to show proficiency by writing. And who will score all of these student-written responses? We’ll get to that in a bit. I’m going in order. C.12.3 The proposal must include details as specified below about its computer-based testing delivery system. The proposal must list a minimum of three customers, within the preceding twenty-four months, utilizing the base platform proposed, or list a minimum of three customers utilizing fully customized platforms within the preceding twenty-four months. Their names, titles, email addresses, and phone numbers must be included in the proposal. The supplier must be prepared to demonstrate significant portions of the proposed system during the proposal review meeting. C.13.1 Support all eligible devices that meet the specifications in the Table 6. The supplier must also commit to continued support for future updates made available on the latest version of Partnership for Assessment of Readiness for College and Careers’ (PARCC) Technology Guidelines that can be found at (http://www.PARCConline.org/technology).Other assistive technologies may be needed for students requiring accommodations. So we’re still not entirely pulling away from PARCC. We just love them for their technology specs. C.30.1 The supplier shall describe the online accommodations that are available for administration of the test to students with disabilities and to students with limited English proficiency (LEP). Suppliers should refer to the existing Oklahoma policies in this regard which can be found in Appendix B of this RFP. The proposal shall confirm that the test can be administered according to these policies. If there are variations of accommodations to be proposed by the supplier, this should be made clear in the proposal. C.30.5 Describe how the needs of students with disabilities and limited English proficiency were included in the early development of the proposed test items and the extent to which such students were included in field tests and other related studies. Together, these two sections give us our only glimpse into the treatment of special education students by OCCRA. Accommodations will be made. I’m glad they were specific. C.36.2 The SDE requires that written responses be read and scored by two sources with at least one of those sources being a human reader. This may include a machine score and a human score. If using a machine score the supplier shall address appropriate procedures to ensure validity and reliability. E.18.1.3 All multiple-choice items will be machine-scored/computer-scored, and short constructed response items can be hand scored by humans or by Artificial Intelligence (AI). Reporting of scores on these items will be based on the procedures specified by the SDE and will include results at the domain level. The supplier will hand score any documents containing student responses upon SDE request to verify student scores. Now we’re there. We casually enter the world of machine-scored essays and AI-scored constructed response items. It comes not as a thump at your door, but in a sub-clause of a sub-clause of a business document. E.20.1 The supplier will conduct standard settings for each content and all grade levels following the Spring 2015 test administration. The SDE will approve the method for setting standards. The supplier will provide psychometricians and content area specialists to facilitate the standard setting meetings. The procedures shall include creating descriptors of what students can do at each of five performance levels. The performance level descriptors are to be unique to each content area. The supplier shall supply evidence of successful standard settings for large-scale assessment programs. The supplier will provide psychometricians and to assist with the information needed for the presentation of cut scores at state board meetings. We all know how much input educators had this year in standard setting. Their recommendations largely went ignored. B.3.1. Once completion dates are mutually agreed upon, and the supplier fails to perform any of the services and/or make deliveries within the time Specified in the contract, or any extension period, the supplier shall in place of actual damages, pay the State of Oklahoma the sum of $15,000 per Calendar day for delayed services/deliveries. The supplier shall NOT be charged when delay in performance and or delivery arises out of causes beyond the control and without fault or negligence of the supplier. B.3.2. Failure to correct any errors in materials or prevent disruptions that negatively alter the ability to administer the test, to use the score reports, or that denigrates confidence in the testing program will be viewed as a violation of the contract and the will pay liquidated damages to the SDE in the amount of 3% of the total annual contract amount for each day during which the online, electronic, paper, print or other document is incorrect until a corrected online, electronic, paper, print or other document approved by the SDE is distributed by the supplier. SDE agrees that when liquidated damages become a possibility, it will expedite its responses and requirements in this regard in an effort to limit the amount of liquidated damages. I guess we’ve learned at least one thing. By the way, if you haven’t read Rob Miller’s analysis of how OCCRA will impact his middle school, I encourage you to give it a look. What educational changes can you expect to see? In 2010, our legislators called for the implementation of college and career ready standards for PreK-12 students in Oklahoma. That commitment raised the educational bar for your children. Beginning this year your children’s teachers will be delivering more rigorous instruction aimed at helping your children achieve these college and career ready standards. How will these educational changes benefit your children? Your children will be taught what they need to know for jobs of the 21st century; jobs that require them to think on their feet and solve problems. How might test scores be affected? We expect that as our schools begin to align assessments to the new, more rigorous academic standards, your children’s test scores may drop. This is understandable and even expected. As teachers and students become accustomed to this new, better way of learning, your children’s test scores will rebound. Thank you for your family’s continued support of improving education in our state! It is important that we all stay the course on implementing college and career ready standards and more rigorous assessments for your children and Oklahoma’s future. We have raised the bar in the past for children. Time and again, they successfully rise to meet the challenge. If there was ever a state that has proven it can rise to a challenge and come out on top, it’s Oklahoma! If you would like to learn more about this transition year and our road ahead, please visit http://www.theroadaheadok.comwww.theroadaheadok.com. Great news! Our school set a record for high attendance this quarter! Great news! We are able to offer music, art, PE, and computer education to all students this year! Great news! The district saved 15% on insurance by switching to GEICO! Great news! Your children are no longer going to be subjected to an endless cycle of standardized testing! Great news! Our state fully funded pay raises for teachers and support personnel, and their health insurance rate increases won’t entirely consume them! That last one does seem a little far-fetched. Dear Parents,In April 2013, our students took end-of-year tests as mandated by state law. This is something we have done for years, but never under circumstances like this or with results such as these.The bizarre journey began in October, when the State Department of Education (SDE) had to delay the annual writing test for 5th and 8th graders by two months because of irregularities in the bidding process. This created a more compressed timeline for the rest of the testing cycle, as the writing tests had to be administered during the late April/early May exam window. Just before the writing tests were administered, schools were notified that the type of writing to be assessed had changed. Then, the inconceivable happened: online testing failed – not just here, but in Indiana, at the exact same time. The servers at CTB/McGraw-Hill (the testing company selected again by the SDE, after the contract had to be re-bid) couldn’t handle the load. Students were kicked out of their tests and had to start over. In some cases, this happened multiple times. Later, when students would re-test, the schools received dual reports. Initially, the SDE blasted the testing company. During the summer, however, State Superintendent of Public Instruction Janet Barresi blamed inadequate technology in schools for the failure. Then, while Indiana negotiated a punitive settlement with CTB, Oklahoma gave them one that appeared costly, but really included free services that no school district in the state has asked for. CTB will continue to serve as Oklahoma’s testing company for this school year. Schools also reported instances of student scores changing from preliminary data to final results. The testing company could not provide an explanation for this, telling schools to use the higher score. Over the summer, the SDE convened educators to reset the standards for the writing and science tests, causing scores all over the state to take a severe drop. By the time students were back in school this August, districts still had not received final test scores. In fact, they still had no preliminary science or writing scores. This includes the Biology End-of-Instruction exam, which is one of the tests that high school students can take to count for graduation. Because of the delay, the SDE still has not provided districts with remediation funds for students who did not pass the EOIs. Meanwhile, the SDE has spent its summer rebranding both the academic standards and the testing process. In 2010, the state adopted the Common Core State Standards for reading and math. Then, two years ago, the remaining content areas that had been labeled PASS since the early 1990s became the C3 standards. Now they are OASS – the Oklahoma Academic State Standards. The SDE even paid for a marketing campaign to promote the rebranding. Nothing is different, except the name. The SDE also announced this summer that Oklahoma would not be giving the PARCC assessment, in spite of the two years that it has spent sending people to national consortium meetings. We also should let you know that next month, the SDE will issue A-F Report Cards for each school and district in the state. This year, the formula for calculating those report cards is completely different than it was last year. Between this and the irregularities in testing, skepticism over score reports, and arbitrary changes to the passing scores, we have very little confidence that these grades will be a reflection of our performance – even if we receive good grades. The inconsistencies and seemingly random changes we have experienced over the last year undermine the very concept of accountability. We honestly have no idea how tests will be administered after this school year. We know that special education students will now take the same test as regular students, but we don’t know what accommodations will be available to them when we start testing over the Common Core. We also don’t know if scores will be reported in a timely manner when we have to make decisions next summer when we are required by law to retain 3rd graders based on these tests. Future standard setting in social studies, reading, and math will also change our passing rates. To what extent this will impact your children, we can’t be sure. In short, we have as many questions as you do. As always, we appreciate you entrusting your children to our care, and we thank you for your support. Yeah, that’s a little long-winded, but I had to get rid of my editor in an effort to curb the administrative overhead around here.